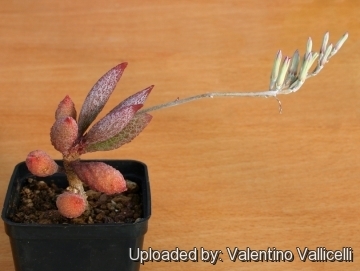 Description: Adromischus marianae var. immaculatus } is one of the innumerable morphological and geographical variant of the very variable Adromischus marianae ). 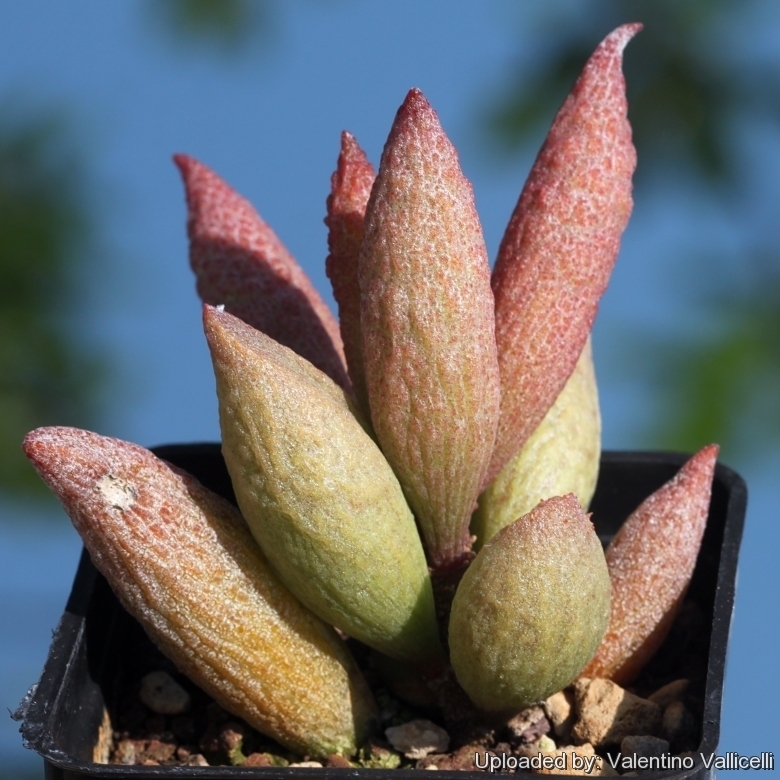 It distinguishes for the cylindrical leaves, but with great variation in marking and texture. This species is highly variable and individuals may be very different one to each other even within the same population. Cultivated plants can be reliably distinguished only when seeds or details of wild source are available. Habit: It is a much-branched small perennial leaf succulent, with thick stems, occasionally continued in fat fibrous roots. Stem: Short, thick ascending often constricted at the base. Leaves: 3-9 cm long, arranged in a spiral on the main stem, oblanceolate or sometime elliptic (rarely obovate), slightly concave on both sides to terete, more-or-less verrucose (or smooth) and never purple-spotted, with an often brown or white raised and horny margin. 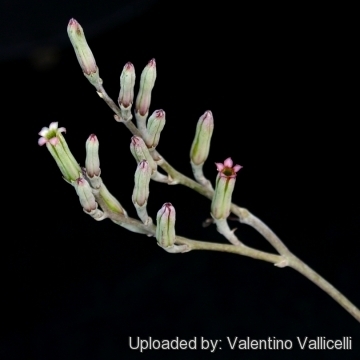 Inflorescence: Spike-like thyrse with 1-flowered cyme 10-25 cm high, grey-green. Flowers: Buds terete, slightly grooved. gradually tapered towards tip, erect at first. later spreading. Flowers 1-1,2 cm long, upright, with 5 fused petals pale pink to white, with a thick bloom. Corolla-lobes 2-3 mm long, acute, spreading or recurved, white with purple margins, rough and with club-shaped hairs mainly in throat. 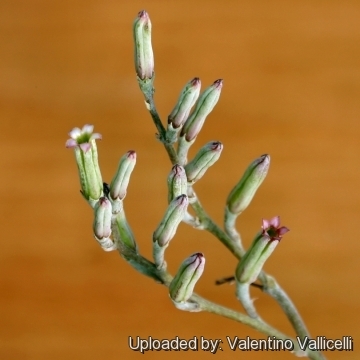 Anthers not protruding from corolla tube.